I'm not exaggerating when I say it's an honor to be invited into a family's home to photograph such a short-lived, joyful, exhausting, and completely euphoric time as they welcome a newborn baby. This session was no exception, I was beyond excited to document this special time for Sam and Adriane. I spent a quiet morning with the Hayes family just 4 days after sweet baby Anna came into the world. Anna is such a perfect little angel, and she totally stole my heart. Baby fever y'all, it's a real thing! I need to pause for a second to talk about Anna's room; the nursery that Adriane created for her baby girl is nothing short of breathtaking. I loved every single detail - and could have spent an hour photographing just the nursery. White, cream, gray with hints of gold, oh yeah and bunnies! Yessss. A huge thanks to the Hayes family for letting me capture some memories for them. 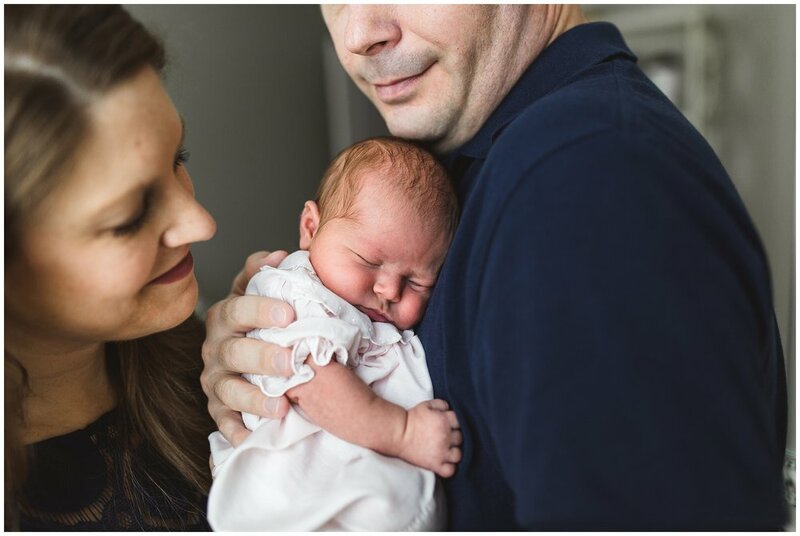 Jamie Vinson is a wedding and lifestyle family, newborn, and maternity photographer serving Raleigh, Durham, Chapel Hill, Wake Forest, Cary and surrounding areas. To inquire or book a session, contact Jamie here or at jamie@jamievinsonphotography.com.